We are pleased to announce that an Institute for Global Prosperity (IGP) team led by Dr Matthew Davies (IGP), in conjunction with the UCL Extreme Citizen Science Group (ExCites) and colleagues in Geography and Anthropology, has secured funding to develop a Citizen Science based project and mobile application to scale up the collection and use of indigenous botanic knowledge in Kenya. The project will utilise a customised version of ExCites Sapelli software and will test and refine data collection, working with existing citizen science groups in both the Maasai Mara and Elgeyo-Marakwet regions of Kenya. The data collection and application testing will aim to capture the botanic knowledge of both Maasai herders and Marakwet farmers. The project will develop strict community protocols and procedures designed to ensure protection of sensitive knowledge and intellectual property, and to record data utilising localised concepts and categories. It will also aim to integrate the data collected with broader data infrastructures such as the African Regional Data Cube and use this for the first time to systematically correlate indigenous botanic knowledge with remotely sensed data at a large scale. We see this as a first step towards empowering community botanic knowledge within a policy and development planning agenda, and look forward to future developments. The Indigenous African Plant Knowledge and Sustainability (IAPS) project is funded by a UCL GCRF research grant. It is led by Dr Matthew Davies (IGP) with Professor Muki Haklay (UCL Geography), Professor Jacqueline McGlade (IGP), Dr Jerome Lewis (UCL Anthropology), Dr Michalis Vitos (UCL Geography), Dr Megan Laws (UCL Anthropology), Professor Henrietta Moore (IGP), Dr Wilson Kipkore (University of Eldoret) and the British Institute in Eastern Africa. 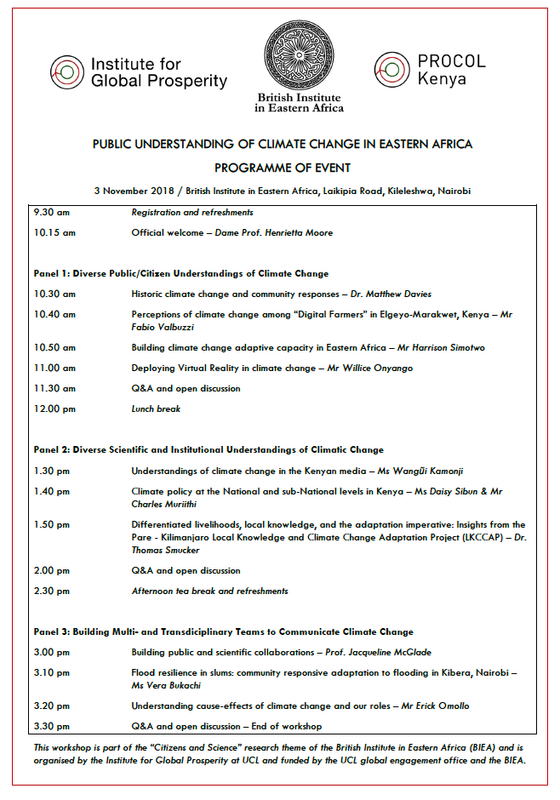 In the first official PROCOL event, the Institute for Global Prosperity (IGP) based at University College London (UCL) worked with the British Institute in Eastern Africa (BIEA) and the UCL Global Engagement Fund to organize a comprehensive workshop on public understanding of climate change. The workshop was organised in three different sessions. Session 1 focused on public and citizen understanding of climate change among the population in certain parts of Eastern Africa, with panellists varying in terms of scope and focus of the work they presented. Citizen perceptions were elaborated on with focus on historic climate change related community responses as well as in relation to a study on “Digital Farmers” in Elgeyo-Marakwet, Kenya and in a country-wide youth-led initiative that deploys Virtual Reality to enhance understanding and awareness on climate change related impact. The second session focused more on scientific and institutional understandings of climate change. Here, panellists discussed how the Kenyan media reports on the issue, what policy documents are currently in place in Kenya at national and sub-national level and what insights can be obtained from a climate change adaptation project in the area of Mount Kilimanjaro, Tanzania. In session 3, panellists discussed the creation of multi- and transdisciplinary teams in efforts of raising awareness and ramping up communication relating to climate change. It was discussed how the public can get engaged with science, how a community in Kibera develops responses and adaptation to problems related to flooding and what our roles are in dealing with dissemination of knowledge about the cause-effect issues of climate change. The workshop was very well attended and a successful start to PROCOL-led initiatives. It was fantastic to have so many people of diverse ages, experiences and knowledge gathered under the BIEA roof to confront a common agenda. We explored public perceptions of climate change from an inter-disciplinary perspective which gave a real richness to our analysis – not just within the speaker presentations but also amongst the questions and lively discussions that followed each session. The workshop was filled with future-orientated discussions which felt equal parts well-informed about the multifarious concerns of climate change and optimistic for the future. This was a refreshing take from other forums that can operate at a more singular official level at the danger of excluding heterogeneous populations and perspectives from important debates. At the same time, the optimistic energy of the debate helped the dialogue from falling into the silos of determinist conclusions and helped us leave the room encouraged for the future. We eagerly look forward to the bright future of PROCOL Kenya and continuing these lively, engaging and responsive discussions at upcoming events. The Institute for Global Prosperity’s Founder and Director Prof. Henrietta Moore writes about the impact of using prosperity “league tables” that aim to tell us who’s getting it right for their citizens, in the face of global challenges such as climate change, and how different understandings of prosperity give us an alternative way of understanding life for communities across the world. “But there's a serious problem in seeing our world in this way. There's an uncomfortably close correlation between these supposedly more sophisticated measures and old-fashioned GDP. Perhaps more troubling in the context of a planet threatened by climate change is the reinforcement of a belief that some countries have "made it", while others need to catch up." In many parts of the world there is widespread dissatisfaction with contemporary economic systems and the impact they have had on livelihoods and the environment. This dissatisfaction has been expressed in diverse ways, from anarchic protests, to calls for 'degrowth', and right wing nationalism. Within this cacophony of divergent voices a small but growing community are arguing that what is needed is not an outright rejection of society and the economy as it stands (whether on the left or right) but rather a re-adjustment of values and ideas, a re-imagining of what society should prioritise, and a re-thinking of what the economy should be and do. This community take their lead from multiple critiques of growth-based GDP economic thinking, such as Stiglitz, Sen and Fitoussi (Mismeasuring our Lives: Why GDP Doesn't Add Up) and the work of thinkers such as Tim Jackson, (Prosperity Without Growth) and Kate Raworth (Doughnut Economics). Many of their ideas are crystallising around the concept of 'Prosperity' as a property that embraces both human wellbeing, satisfaction and capability, alongside the health, sustainability and resilience of the natural world. The Institute for Global Prosperity (IGP) at University College London was established to enhance, refine and disseminate just such ideas about prosperity, and most importantly to turn them into operational policy so that they can help shape peoples lives for the better. More than this, researchers at the IGP argue that prosperous societies do not take one form or one type, but rather that prosperity has multiple forms for different peoples, cultures and places and that it must be co-created or generated by the people in those contexts. This simple idea is radical, because it argues that there is no singular path to development or progress, no model to be transferred from one place to another, no 'developed world' or 'Global North' to be copied. Instead, prosperity must be generated in context and in today's changing, unstable and unpredictable world, new forms of prosperity are just as likely to emerge from the 'Global South' as they are from the Global North. In other words models for change from Africa, indeed from Kenya, may be globally inspirational and better suited to the challenges of the future than those from the 'old world'. The IGP has been working in Kenya and across Eastern Africa since its inception. While Kenya embodies many of the challenges faced across sub-Saharan Africa, we also see Kenya as a hub of innovation and inspiration, and we aim to foster home-grown solutions to these challenges. In 2018, the IGP established Prosperity Co-Lab (PROCOL) Kenya to begin a debate about what prosperity really means in Kenya and across Eastern Africa. We want to understand the real voices of citizens, value the knowledge, experience and ideas that they have and then work with communities, government and other stakeholders to co-design novel, innovative pathways to prosperity that break from the old norms of economic growth and market integration. We also aim to build the robust empirical data and research on which these novel pathways to prosperity can be based and are calling for multiple partners to achieve these ends. On the 2nd November we launched PROCOL Kenya at an event at the British Institute in Eastern Africa (BIEA). The launch built on work already being conducted by the IGP with several Kenyan partners which has focussed on rural livelihoods and the future of agriculture (especially in Elgeyo-Marakwet County), and which include approaches to engage with and foreground citizen experiences, especially through the concept of Citizen Science. We also showcased work into new possibilities of collecting, collating and disseminating data, especially around the African Regional Data Cube. At the launch we were able to hear from a range of existing project partners, including Professor Grace Cheserek from the University of Eldoret, Dr Rosemary Okello from Strathmore University, the Elgeyo-Marakwet County Government, Dr Wilson Kipkore from the University of Eldoret, Mr Timothy Kipruto from the Marakwet Research Station and Dr Freda M'Mbogori from the BIEA. All spoke to the need for new alternative paradigms for change and embraced the key role of Kenya in generating models for change which value the knowledge and experience of its citizenry and home-grown thinkers. Over the coming months and years, we hope that PROCOL Kenya will not only contribute to the emerging counter narratives around the idea of prosperity but that it will come to shape and refine them: adding a voice and ideas that represent a truly global vision of prosperity, which embraces difference and champions diverse values and perspectives. We believe that Kenyans have a great role to play in positively shaping the future in dynamic ways which break from old norms, and we hope that PROCOL Kenya will be a start to this process. Do please join us in this ambition! If you would like to hear more about PROCOL Kenya and how you might like to get involved, please do contact Dr Matthew Davies (matt.davies@ucl.ac.uk).